Members of the community joined thousands countywide and millions around the nation on Veterans Day, Tuesday, November 11, to honor all who have served in the military. The annual federal holiday began as Armistice Day to honor the end of World War I, which officially took place on November 11, 1918. But, on June 1, 1954, November 11 became a day to honor American veterans of all wars. 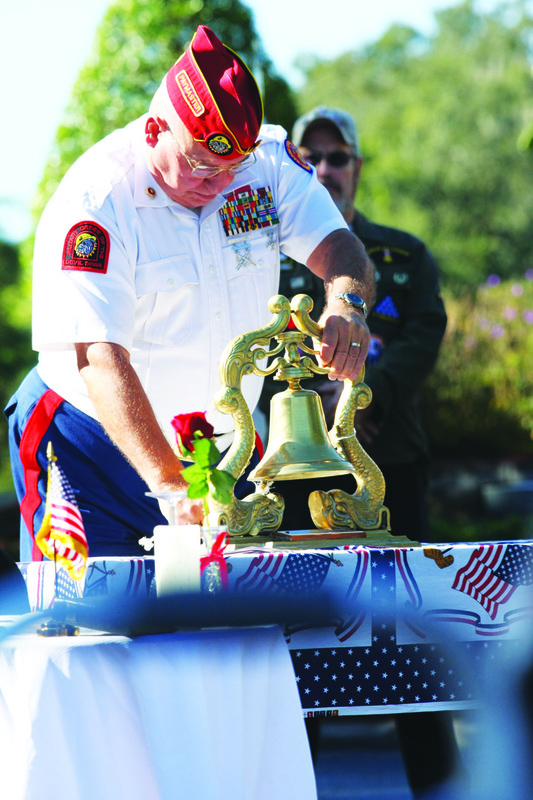 Local ceremonies included the annual “Day of Honor” ceremony, hosted by Serenity Meadows Memorial Park in Riverview on Monday, November 10, as well as Hillsborough County’s 50th Annual Veterans Day Tribute, held on Veterans Day at Veterans Memorial Park and Rear Admiral LeRoy Collins Jr. Veterans Museum at 3602 U.S. Hwy. 30. Both events had no shortage of special guests representing the U.S. military, including Colonel Paul A. Bugenske, Director of Procurement U.S. Special Operations Command who was joined by Colonel Reginald O. Gobolt, Commander 6th Maintenance Group 6th Air Mobility Wing, MacDill Air Force Base. Both men spoke to all present at Serenity Meadows, where the event commenced with a special appearance by the Phantom Airborne Brigade Paratroopers, who under the direction of Ret. Colonel Dave Blizzard, USMC dropped in following an 800 ft. jump to take part in the ceremony. “The guys did an outstanding job, befitting the occasion,” Blizzard said. Hillsborough County Government also joined the nation on Veterans Day and, in conjunction with the Veterans Council of Hillsborough County, Inc., held its 50th Annual Veteran’s Day Tribute. The ceremony began with the presentation of the colors by the Middleton High School Air Force JROTC Cadets who were joined by more than 50 JROTC Cadets from 10 area high schools to perform a drill demonstration and a Pass-In-Review. The POW/MIA Missing Man Ceremony (held also at Serenity Meadows) commemorated those who have not yet made it home, and was followed by a Wreath Tribute presented by the Gold Star Wives, Gold Star Mothers and Gold Star Families of America. The playing of taps and a rifle salute rendered by the Marine Corps League Riverview Detachment added to the completion of the ceremony. Retired Lt. Col. James W. Haake, USA, served as Master of Ceremonies, while retired Lt. Gen. James R. Ellis, USA, former Commanding General of the Third Army (the Army component of CENTCOM) served as the keynote speaker. Attendees enjoyed a special presentation of an Action Trackchair made by Freedom Alliance’s Executive Director, Calvin Coolidge to 1st Lt. Nate Nelson, USAF, who served during Operation Enduring Freedom. The Florida Division of the Federal Highway Administration designated a portion of U.S. 301 between Adamo Dr. and Martin Luther King Jr. Blvd. as Sergeant First Class Paul R. Smith Memorial Highway, while a portion of Martin Luther King Jr. Blvd. between I-75 and I-4 is now designated as POW/MIA Memorial Highway. A portion of the Veteran’s Expressway between S.R. 60/Courtney Campbell Causeway and Dale Mabry Hwy. will now stand as RADM LeRoy Collins, Jr. Veterans Expressway and a portion of 50th Street between Palm River Rd. and Causeway Blvd. is now designated as Deputy Sheriff David Anthony Abella Memorial Highway. For more information about the events, visit www.hilsboroughcounty.org. or www.serenitymeadows.com.